FOUNDING: Rochdale began as a response to a growing need for student housing at the University of Toronto, and a nineteen-year-old entrepreneur and philosophy student, Howard Adelman, was hired by the Campus Co-operative to meet the housing demand in 1958. Opened in 1968, Rochdale College was an experiment in student-run alternative education and co-operative living in Toronto, Canada. It provided space for 840 residents in a co-operative living space. It was also a free university where students and teachers would live together and share knowledge. The project ultimately failed when it could not cover its financing and neighbours complained that it had become a haven for drugs and crime. It was closed in 1975. In the late sixties, universities were centres of political idealism and experimentation. Rochdale College was established as an alternative to what were considered traditional paternalistic and non-democratic governing bodies within university education. Conversely, Rochdale's government policy was decided at open meetings in which all members of the co-operative could attend, participate in debate, and engage in consensus decision making. It was the largest of more than 300 tuition-free universities in North America, and offered no structured courses, curriculum, exams, degrees, or traditional teaching faculty. From humble beginnings in seminars on phenomenology and a Recorder Consort that performed with the London (Ontario) Symphony Orchestra, it became a hot bed of free thought and radical idealism. Rochdale College never used traditional professors or structured classes. Posting notices on bulletin boards and in a student newsletter, groups of students coalesced around an interest, and "resource people" were found with various academic and non-academic backgrounds, who led informal discussion groups on a wide variety of subjects. 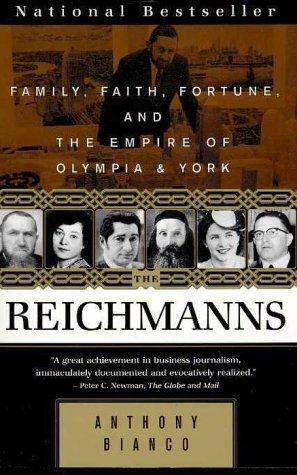 Resource persons of note included an Anglican priest, Alderman and later Member of Parliament, Dan Heap, author Dennis Lee and Futurian Judith Merril, who founded Rochdale's library. Rochdale participants were involved with various cultural institutions in Toronto such as Coach House Press, Theatre Passe Muraille, The Toronto Free Dance Theatre, This Magazine is About Schools (now This Magazine), the Spaced-out Library (now the Merril Collection of the Toronto Public Library) and House of Anansi Press. Students had complete freedom to develop their own learning process, much of which emerged from the shared community experience. The college included theatres for drama and film, and a ceramics studio. Students decided school policy and made their own evaluations. It was typical of the free universities not to award degrees and the University of Toronto did not offer degrees through Rochdale College. Indicative of the playful humour of the times, anyone could purchase a B.A. by donating $25 to the college and answering a simple skill-testing question. An M.A. cost $50, with the applicant choosing the question. A Ph.D. cost $100, no questions asked. The Rochdale application also described its "non-degree": "We are also offering Non-Degrees at comparable rates. A Non-B.A. is $25.00. Course duration is your choice; requirements are simple, we ask that you say something. 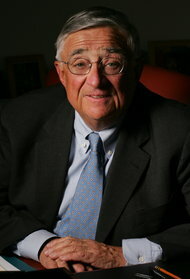 A Non-M.A. is $50.00 for which we require you to say something logical. A Non-Ph.D. is $100.00; you will be required to say something useful." Nobody at Rochdale ever took these degrees seriously, and the fees (if any were collected) were treated as voluntary donations. Rochdale ran its own radio station called CRUD, with an unusual assortment of music, talk, and static. The Canadian Radio-television and Telecommunications Commission tried to shut the station down a number of times, but the dedication of its staff kept it on the air. Rochdale was the largest co-op residence in North America. Rochdale occupied an 18-storey student residence at Bloor St. and Huron St. in downtown Toronto. It was situated on the edges of the University of Toronto campus, near to Yorkville, Toronto's hippie haven in the 1960s and early 1970s. The college took its name from Rochdale, a town in north-west England, where the world's first cooperative society was established in 1844. The Rochdale Society of Equitable Pioneers is usually considered the first successful co-operative enterprise, used as a model for modern co-ops, following the 'Rochdale Principles'. A group of 28 weavers and other artisans set up the society to open their own store selling food items they could not otherwise afford. Within ten years there were over 1,000 co-operative societies in the United Kingdom. The college's modern architecture was uniquely designed for communal living. Some areas were divided into independently operated communal units of about a dozen bedrooms (called ashrams), each with its own collective washroom, kitchen and dining room. Each unit was responsible for collecting rent and maintaining its own housekeeping. Other areas consisted of bachelor, one-bedroom, and two-bedroom apartments. On the first and second floor were common areas used for socialization, education, and commercial purposes. The roof was accessible from the 18th floor and was used for sunbathing. Clothing was optional. The Unknown Student sculpture in front of the Rochdale building on Bloor St.
John Denison was the head of a large family of Toronto landholders and military men, who had considerable influence for over a century, from 1797 until the death in 1925 of George Taylor Denison III, his great grandson. John Denison was born in Yorkshire, in 1755. He was a captain of the militia, a miller, and a brewer. In December 1782, he married Sophia Taylor, Sophia and Russell’s sister Elizabeth were childhood friends. On the inducement of Peter Russell, the Denisons came to Canada, settling first in Kingston and finally in Toronto. For several years he was manger of Russell’s farm Petersfield, which prospered under his care. Over the years, Denison received several grants and began to accumulate property, including the park lot immediately west of Petersfield. He also purchased property overlooking the Humber River which the family named Black Creek Farm. 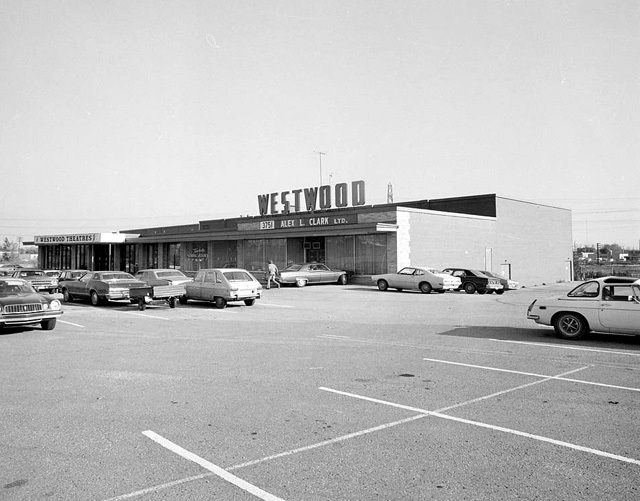 In 1815, he bought park lot 25 and built Brookfield House, at the north-west corner of modern Queen and Ossington. Enormous willows cast shadows across the fine lawns and gardens. Although John Denison died in October 1824, his widow lived on at Brookfield for many years. Most of his property was inherited by their eldest son, George Taylor Denison, with the exception. of the house. In 1845, Sophia had transferred Brookfield House and four acres surrounding it to her son-in-law, John Fennings Taylor. After the Lunatic Asylum was constructed on the south side of Queen in 1846, the area around Brookfield House deteriorated. The house was demolished, and smallish lots were sold. Ossington Avenue received its name from the family seat of Ossington House in Nottinghamshire. For notes on LostRivers.ca about the other Denisons and their houses see: Bellevue, Dover Court House, Heydon Villa and Rusholme. For more about Brookfield and John Denison, see "The Estates of Old Toronto" by Liz Lundell. Stephen Bocking (Trent University) presents the seventh lecture in Toronto Public Library's 2011 History Matters series. 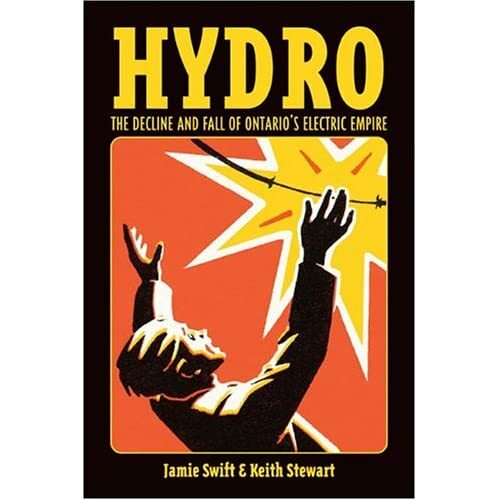 These lectures focus on labour and environmental history in the Toronto area and beyond. Part of TPL’s Thought Exchange programming, these lively talks give the public an opportunity to connect with working historians and to discover some of the many and surprising ways in which the past shapes the present. The series has been curated by Dr. Lisa Rumiel, SSHRC Post Doctoral Fellow McMaster University, and we are especially grateful for a generous grant provided by The History Education Network (THEN/Hier), which has made the series possible. Hyundai Motors Company (Hangul : 현대 자동차 주식회사) (Hancha : 現代自動車株式會社) (Korean: 현대, Hyŏndae, modernity; KRX: 005380) is a Korean automaker which along with Kia comprises the Hyundai Kia Automotive Group, the world's fourth largest automaker as of 2009. As of 2009, it is the world's fastest growing automaker. In 2008, Hyundai (without Kia) ranked as the eighth largest automaker. Headquartered in Seoul, South Korea, Hyundai operates the world's largest integrated automobile manufacturing facility in Ulsan, which is capable of producing 1.6 million units annually. The company employs about 75,000 persons around the world. Hyundai vehicles are sold in 193 countries through some 6,000 dealerships and showrooms worldwide. In 2010, Hyundai sold over 1.7 million vehicles worldwide. Daegu, also known as Taegu, and officially the Daegu Metropolitan City, is the fourth largest city after Seoul, Busan, Incheon, and the third largest metropolitan area in South Korea. 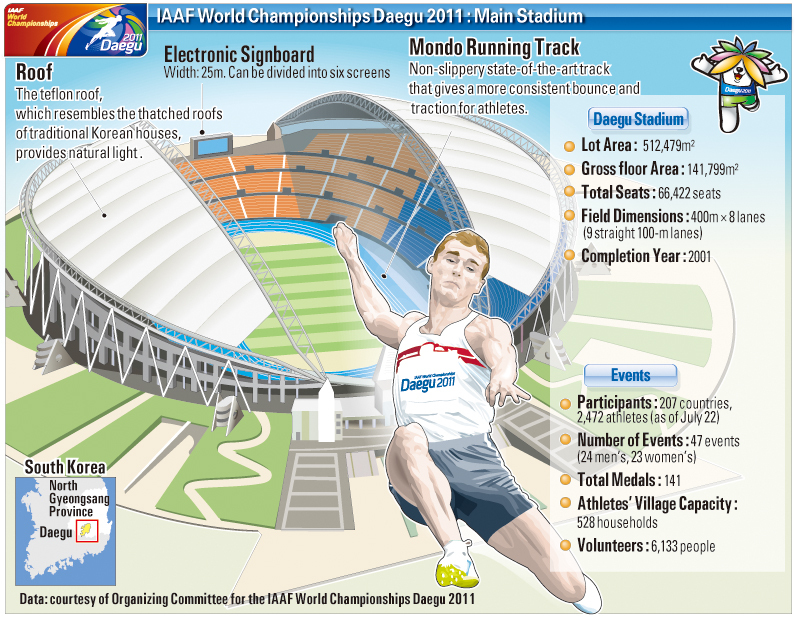 The 2005 census first found that Incheon's population was larger than Daegu's. with over 2.5 million people. The city is the capital and principal city of the surrounding province, Gyeongsangbuk-do, although it is not legally part of the province. These two areas are often called Daegu-Gyeongbuk, and have a combined population of over 5 million. The city is located in south-eastern Korea about 80 km inside from seacoast, near the Geumho River and its mainstream, Nakdong River in Gyeongsang-do, also called the Yeongnam region. The Daegu basin, where the city lies, is the middle part and rare plain of that region. It made the city the region's center of politics, economy, and culture. In ancient times, Daegu was part of the Silla Kingdom which unified the Korean Peninsula first, and in the Joseon Dynasty period, it was the capital of Gyeongsang-do which was one of eight provinces of the country. The city also was the home of the regimes in South Korea's rapid economic growth period (1960s–1980s). Today, the city has become one of the major cities of the country and is making efforts to be the center of the fashion and high-tech industries. Due to its status as a cultural center, there are many nicknames for the city including "Apple City", "Beauty City", "Textile City", "Fashion City"
The premises were destroyed by fire at the time of Japanese occupation from 1592-1598. However, all of the palace's 7,700 rooms were later restored under the leadership of Heungseondaewongun during the reign of King Gojong (1852~1919) . Kings and queens of Joseon living in royal residences such as Gyeongbokgung Palace, Deoksugung Palace, and Changdeokgung Palace had built a magnificent and sublime royal culture during the Joseon Dynasty. Their beloved palaces were brimming with art treasures from the greatest artists of that time. What dresses did they wear? What paintings did they see? What tools did they use? The National Palace Museum of Korea, which will be shortly introduced, will satisfy all your curiosities. The National Palace Museum of Korea is a royal museum, which exhibits royal artifacts and related materials of the Joseon Dynasty (1392~1910). 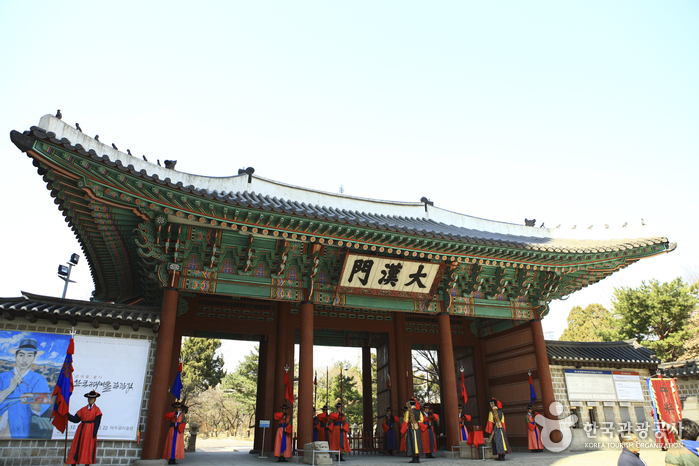 The Royal Museum in the Stone Hall of Deoksugung Palace was moved to a significantly larger location at Gyeongbokgung Palace and re-opened under the name of “The National Palace Museum of Korea” on August 15, 2005. The Museum has about 40,000 collections of precious royal artifacts found in Joseon’s palaces, and for the present about 700 collections are exhibited on the 2nd floor halls. All of the exhibit halls on the 1st floor and the basement will be opened by the year 2007. Gwanghwamun Square was created by reducing16 lanes of traffic down to 10 in the middle of Sejong-ro, which connects Jongno-gu Gwanghwamun to Sejong-ro intersection and Cheongye Square. Constructed started May 27, 2008, and it opened to the public on August 1, 2009. The 557meter long, 34 meter wide Sejong-ro, the heart of Seoul with 600 years of history, was transformed into a human focused space that harmonizes with the beautiful sceneries of Gyeongbok Palace and Bukak-san, which completed the rebirth of Sejong-ro for historical and cultural experiences. "Historical Flow" measures 1 meter wide and 365 meters long on both side edges of square. The east flow has 617 stone boards written with major historical events from 1392 (the start of the Joseon period) to 2008. The west flow has empty stone boards waiting to be recorded for the future. 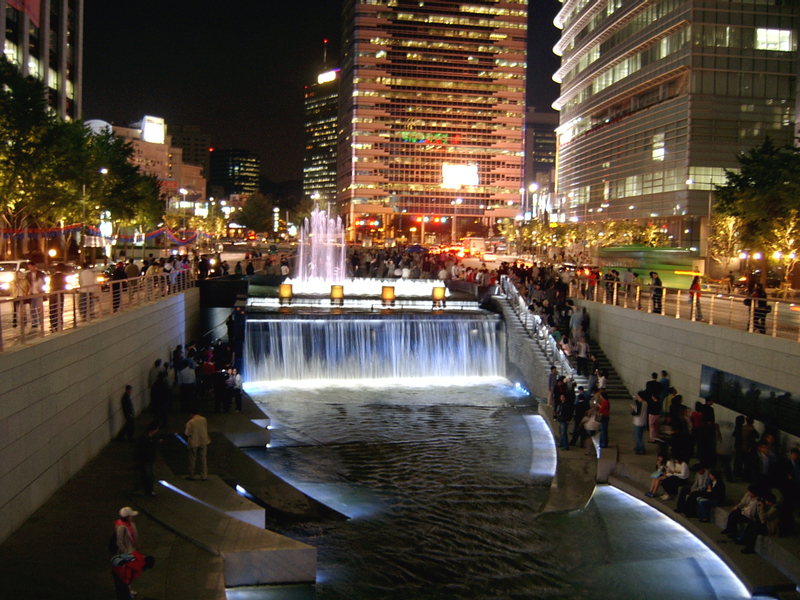 This "Historical Flow" plays a role of passing underground sourced water generated from the Gyeongbok Palace and Gwanghwamun subway stations to Cheongyecheon. A fountain installed around the statue of Lee Sun Sin is also known as Music Fountain as it also plays music. However, its official name is "12.23 Fountain," which indicates the great Myeongryang Victory of clearing 133 Japanese ships by 12 Korean ships and Lee Sun Shin's perfect record of 23 wins in 23 battles. The center of the Square between Sejong Cultural Center and the status of Lee Sun Sin is utilized for various display purposes. The north part of the Square has a colorful "flower carpet" 17.5 meters wide and 162 meters long expressing the number of days from October 28, 1394 (the date of the Joseon Dynasty's settling of Seoul), to August 1, 2009 (the date of the opening of Gwanghwamun Square). The "Square of Recovering History of Gwanghwamun" has restored Waldae (the stone placed in front of a palace or castle) and a miniature model representing the past center of the area. The whole renewed area of Gwanghwamun stands as a symbol for the revitalization of Seoul. 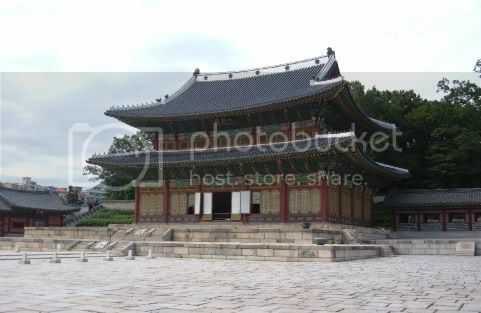 The palace gained in importance starting from the time of 9th king of Joseon, Seongjong, when a number of kings began using it as a place of residence. Unfortunately, the palace was burned down by angry citizens in 1592 when the royal family fled their abode during the Japanese Invasion of Korea. Thanks to Gwanghaegun, the palace was restored in 1611. 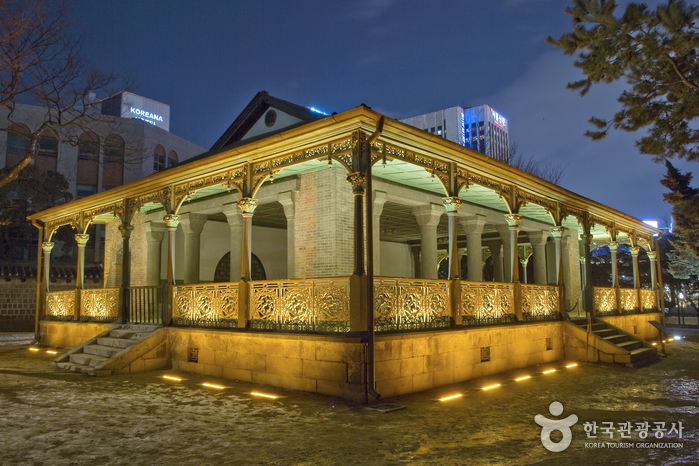 Even today, it holds a number of cultural treasures such as Injeongjeon Hall, Daejojeon Hall, Seonjeongjeon Hall, and Nakseonjae. Though it has been treasured by Koreans for centuries, the Changdeokgung Palace was not designated a World Cultural Heritage by the World Cultural Heritage Committee until December of 1997, at the committee meeting in Napoli, Italy. 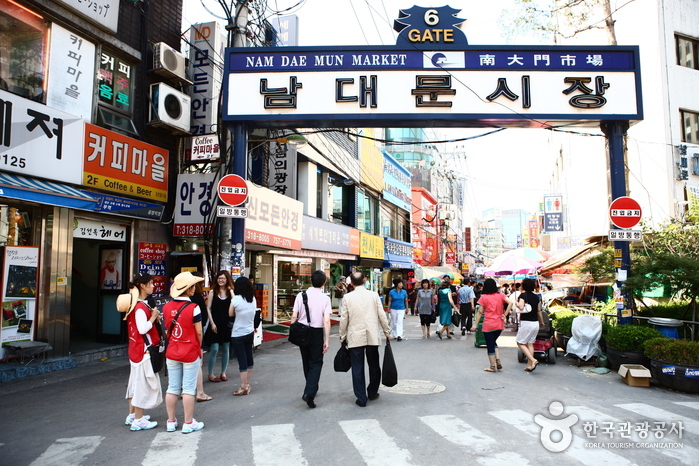 Namdaemun Market, located in the very center of Seoul, is the biggest traditional market in Korea selling children's clothing, men & women's clothing, daily miscellaneous goods, kitchenware and local and imported products. Most shops have their own factories and make the products themselves offering both wholesale and retail prices which enable visitors to purchase various shopping items at extremely inexpensive prices. Foreign visitors to Namdaemun Market show different tastes: the Japanese are more into foods like gim (seaweed), gimchi, and ginseng, while the Chinese show interest in clothing and miscellaneous goods. On the other hand, most tourists from the West simply enjoy the ambience of the traditional market. Hours vary by store, so it's advisable to plan in advance according toa shopping list before you start actual shopping. If you get off at Chungmuro Subway Station, you are right in front of Namsangol Hanok Village (traditional Korean village). You may consider it interesting to find this area standing between the tall buildings. This village has five restored traditional Korean houses and a pavilion, a pond and a time capsule, which make it a perfect spot to take a walk. When you enter the front gate, you will see the vast valley and the Chunugak building to the left of the pond. Along with the pond, it is a splendid place where performances are held. On the side you will see five traditional houses. These houses were rebuilt after the traditional houses of Joseon Dynasty and belong to those of various social classes, ranking from peasants to the king. The furniture in the house is situated to help guests understand the daily life of the past, and the clean, traditional houses and their antique items provide a great photo op. If you would like to check out some souvenirs, stop by the traditional craftwork exhibit where you can buy small dishes and other items. You can also have traditional tea and refreshments. On the grounds, there are traditional games you may try such as 'neolttwigi' (sea-saw jumping), 'tuho'(arrow throwing) and 'yunnori' (traditional game of throwing wooden yut sticks). Don't forget to go see the traditional marriage ceremony! During the weekends, traditional marriages are shown at Bak Yeong Hyo's Residence. The traditional marriage ceremony is an interesting event for both Koreans and foreigners and many gather to watch. During the winter season (November to February), there are not as many wedding ceremonies as held in the spring and fall. Weddings are typically held around noon or 1 p.m. and visitors can take pictures with the husband and wife wearing traditional wedding costumes. There is also a time capsule commemorating Seoul’s 600 Year Anniversary that was buried in 1994 and is scheduled scheduled to be reopened four hundred years later in 2394. N Seoul Tower located on Mt. Namsan offers great panoramic views of the city, and has been a symbol of Seoul since it first opened to the public in 1980. The tower has not only been given a new look, but also a new name following a complete makeover. It is now a true cultural space with various performances, movies, exhibitions as well as upscale restaurants and snack bars. We took City Circulation Course: 26 Stops! 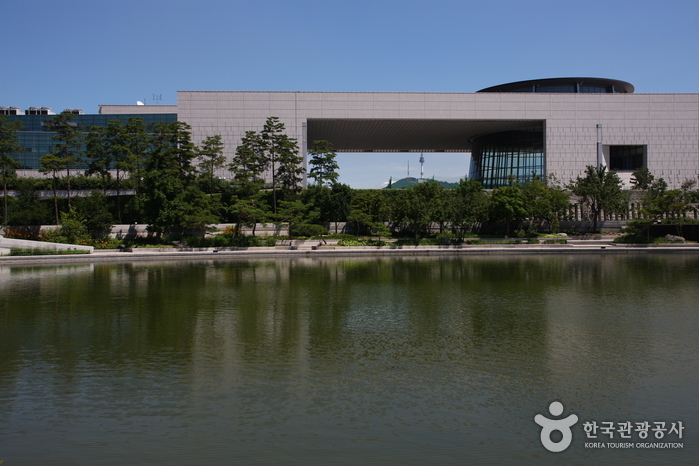 The National Museum of Korea is located only 1.5km away from Yongsan Station. It is the largest museum in Korea and houses precious Korean cultural assets that silently tell the story of Korea’s fascinating history, from ancient days to the modern era. The museum, in turn, is close to Yongsan Family Park, a wooded grassland with a pond that serves as a natural habitat for various species of birds, as well as over 80 different kinds of trees. The War Memorial of Korea is located approximately 1km from Yongsan Station toward Samgakji. It displays a daunting array of collections and wartime relics. In public activism, as in his published works and interviews, McLuhan used dense language that often baffled audiences. As McLuhan's friend Claude T. Bissell put it in his introduction to George Sanderson and Frank Macdonald's Marshall McLuhan: The Man and His Message (Fulcrum, 1989), McLuhan's statements "were 'probes,' designed not to give ultimate answers, but to shed light on dark places." Expressing ideas in "an aphoristic prose style," another source notes, "[h]e emphasized the connectedness of things and built what he called 'mosaic patterns' of meaning, rather than offering mere argument using one-dimensional specialist logic." And unlike other academics, he never hedged his statements but made bold, generalized pronouncements based on often scanty evidence. For example, he wrote an op/ed for the Staron March 9, 1971, in opposition to early proposals for the Eaton Centre that called for razing Trinity Church. In it, he bluntly compared the way real estate developers gained leverage over city council to how terrorists hijack a plane. 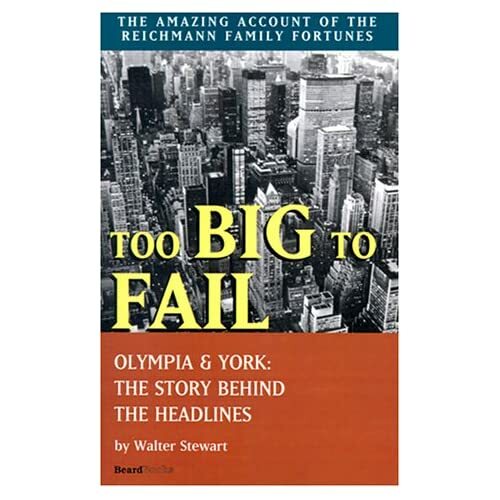 "The most spectacular and successful, but unseen, hijack has been the takeover of the North American city by the commercial developers," he wrote. "Like the hijacker in the airplane, the only concern of the developer is a private destination, without any assumption of the responsibility for the flying, or governing, of the airplane or city." As a result of McLuhan's opaque way of communicating ideas in his urban activism, some surreal or absurd debates ensued. An example was when the ever-obtuse McLuhan tangled with Allan Lamport, who was well known for mangling the English language to form his own unique aphorisms, during a debate over a street widening. McLuhan's interdisciplinary centre, by the fall of 1968, had been relocated to a 19th-century coach house on a lane adjacent to St. Joseph Street. By the summer of 1970, the municipality wanted to widen St. Joseph Street, where it ran through the middle of St. Michael's College, from 24 feet to 30 feet. It would necessitate removing trees and parking to allow for increased traffic. Mr. McLuhan: Moreness is not conducive to sanity or dialogue. The university is a place of dialogue, encounter, awareness. The present program of moreness may make the next dialogue impossible. There is disadvantage in dialogue with a large truck. I cannot converse with a jackhammer. Even economists see that the cult of moreness is finished. The GNP is no longer the test of health. By the time economists can see something, you may be past the point of no return. They are the last to see anything. They are drunk with figures. Moreness is the alcoholic's dream of a cure. The cure is at the bottom of the next bottle. Alderman Lamport: Couldn't we get back to the subject? Mr. McLuhan: Yes, the subject is the campus and what you are doing to it. The subject is moreness. You want moreness. Mr. Lamport: The widening will do a lot of good in the area and I'm surprised at the furor. Father Kelly's been most fair, and we have to rely on the more dignified type in the community like yourself, Father, to be objective. But it would only be something created by pressure if we don't widen the street. Alderman William Archer: You got Sunday sports by pressure, Lampy. Mr. Lamport: That wasn't done by small minds. The city cannot progress if every little satisfactory improvement is due for a fight by a local group. You can't stop making automobiles. They create employment. This city's become great by people who have strong minds. Let's not talk chicken talk. Mr. McLuhan: Every bureaucracy in the world is breaking down, including yours and the university's, through speed-up—the factor for breakdown is the efficiency of speed. Anything that speeds up an environment around another environment destroys the environment it surrounds. The result of the deputation was a compromise, with St. Joseph Street being widened, but not by as much as anticipated. 2. I will consider buying an older home over a new one. Older homes are usually in established neighbourhoods; this means I can walk to do some errands, just like my grandparents did. Even if I must replace a furnace, a roof or windows, or even take down a wall, I am still celebrating the fact that the greenest building is the one that already exists. 4. Fine-art and antique collectors appreciate things with a rich patina and story. They know, going in, that they are not the end user – that sculpture, painting or handcrafted table will belong to someone else one day. In a word, they know they are stewards. I will try to think of myself as a steward of my home or building rather than master of its fate. 5. What will the next generation think of the renovations I’ve done? Am I jumping on a bandwagon or am I considering the true needs of my family or business? 6. Our city is too often criticized as one that neglects its built heritage; jokes about demolition being a competitive sport are becoming commonplace. Architecture is a snapshot of what we value – think of the R.C. Harris “Palace of Purification” or Mies van der Rohe’s one-storey Toronto-Dominion banking hall. While I may not own something of that calibre, what am I saying about my own values if I demolish something that’s still usable? 7. Related to No. 6: If my heritage commercial building no longer serves a purpose, I will rethink selling to condo developers. Perhaps I will make it a condition of the sale that the entire building rather than just the façade be retained, since great design is a result of smart architects who enjoy a challenge. 9. 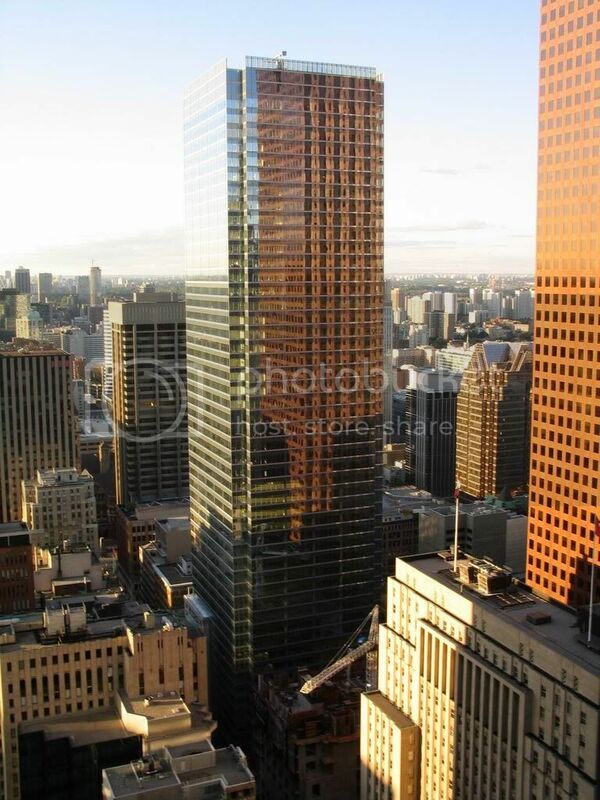 Do I want my home or building to be featured in the eventual sequel to William Dendy’s Lost Toronto? 10. Even if it’s only once a year, I will go on an architectural walking tour or visit Doors Open because the enthusiasm of the guides is contagious. These events are also good reminders that we have a colourful gallery of rogues, heroes, triumphs and tragedies to rival any North American city, from the amazing story of rebirth behind the Carlu to the sad story of the British-born architect Peter Dickinson, who died just shy of his 36th birthday in 1961 (imagine if he’d have lived another 40 years?). 11. While I may think the University of Toronto’s Robarts Library is ugly, I will endeavour to understand why other people like it. I will remind myself that there was a time when E.J. Lennox’s Old City Hall was considered ugly and expendable too. 12. Any friends who say they are too busy to think about architecture will be brought to my architectural “happy place” – whether that’s the grand hall at Union Station or a friend’s arts-and-crafts living room – and then asked if they don’t feel inspired. If you still think none of these apply to you, consider this: In a March, 2011, “open letter” to the federal political parties, the Council for Canadian Urbanism (CanU) – an advocacy group that includes urban planners and architects from across the country – pointed out that Canada is now a solidly urban country, as more than “80 per cent of Canadians live and work in urban settings.” They argued that future federal funding must concentrate on “urban resiliency and ‘smart growth’ (i.e. complete and compact communities, expanded transit and rail, renewing aging urban infrastructure, enhancing cultural and civic amenities etc. ), rather than on ‘shovel-ready projects.’ ” Just one person can hold a shovel, so I would argue that our future lies with you. 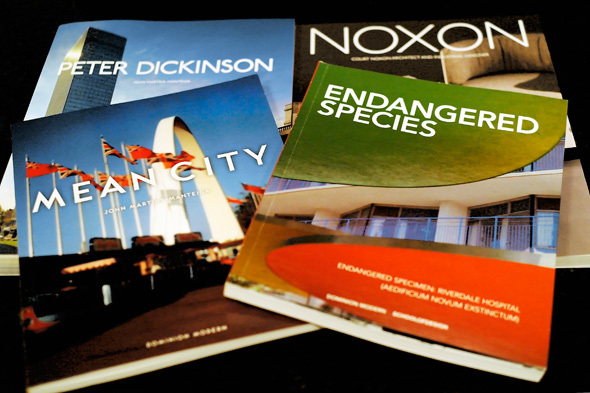 Dominion Modern is Canada’s foremost archive of 20th Century Canadian architecture and design. Our mission is to collect, catalogue, preserve, and promote public awareness and understanding of our architectural and design heritage. Since 2003, Dominion Modern has established itself as a leading authority on this essential, yet often overlooked, period in our nation’s cultural development. At a time when much of the city’s modern architecture is being lost to the wrecking ball, its fans think they have a solution. All it will take to allow the Dominion Modern Museum to find a permanent home is $2-million. Mr. Martins-Manteiga thinks he has found a suitable building to provide a permanent home for the Dominion Modern, which he established in 2003 as an archive of modern architecture and design. He hopes to establish a blue-ribbon panel of Torontonians to give prominence to fund-raising efforts. Toronto city councillor Adam Vaughan, an ally of the museum whose father Colin worked as an architect in Toronto during the fifties and sixties, said he is confident funding can be raised pretty quickly. Catherine Nasmith, a Toronto architect and president of the Architectural Conservancy of Ontario, said the postwar building boom reflected one of the most optimistic periods in Canadian history, but that architectural legacy is now under attack. 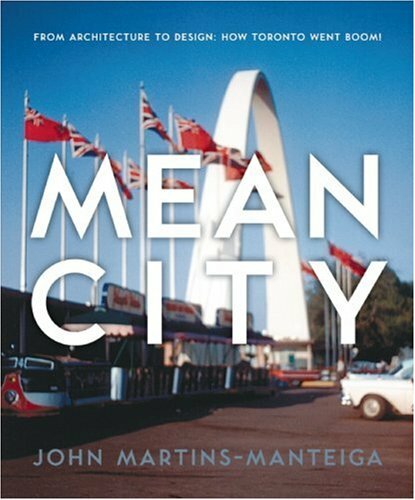 Mr. Martins-Manteiga is an indefatigable, if quixotic, crusader for Toronto’s threatened architectural gems of the modern period, an era that stretches from perhaps the 1930s to 1970. 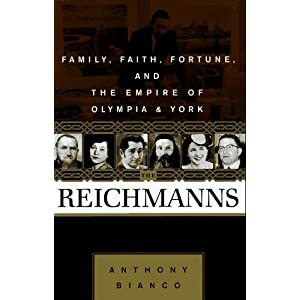 He’s had more failures than successes, as developers knocked down the old Inglis plant for townhouses, Loblaws bought Maple Leaf Garden to gut it for a food store, and wreckers demolished the Bata Shoe Headquarters, the Inn on the Park and the old Riverdale hospital. The striking half-round Riverdale Hospital building appears to be the next one to go. Although Ms. Nasmith appreciates the work already done by the Dominion Modern to create a record of modern architecture, she does not want a museum collection to be the only evidence of an era. “These buildings should be looked after and enjoyed,” she said. While happy to talk about his plans for the museum, Mr. Martins-Manteiga is reluctant to say too much about the building he has found. He still remembers what happened when they looked at the former TD Bank building at Queen Street West and Ossington Avenue. With the museum’s expanding collection of artifacts and material languishing in storage, Mr. Martins-Manteiga speaks with a sense of urgency. He is currently completing two books, one about architect Peter Dickinson and the other on the Montreal Métro.